Have a very happy Halloween night – stay safe! And be careful with those candy calories (check out yesterday’s post if you need a primer)! Wild Weekend: Football, Classes and Marathon (Parking) Madness! Let me first state that no, I did absolutely not run the Marine Corps Marathon this morning. But living along the path of the course has made today a bit … challenging. But I’ve learned throughout the years that there will be a few days a year that my neighborhood becomes a traffic nightmare to accommodate a race. The highlight of my weekend, naturally, was something I’ve been looking forward to since … well, two years ago, to be totally honest. 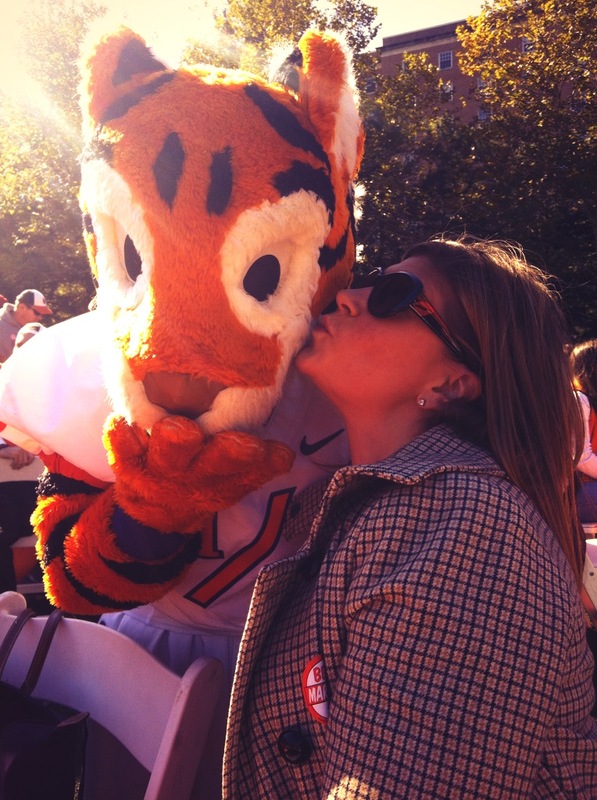 My Clemson Tigers made their FINAL trip up to the University of Maryland before they leave the ACC at the end of the school year, and I talked my girl Helen into joining in on the fun with me. 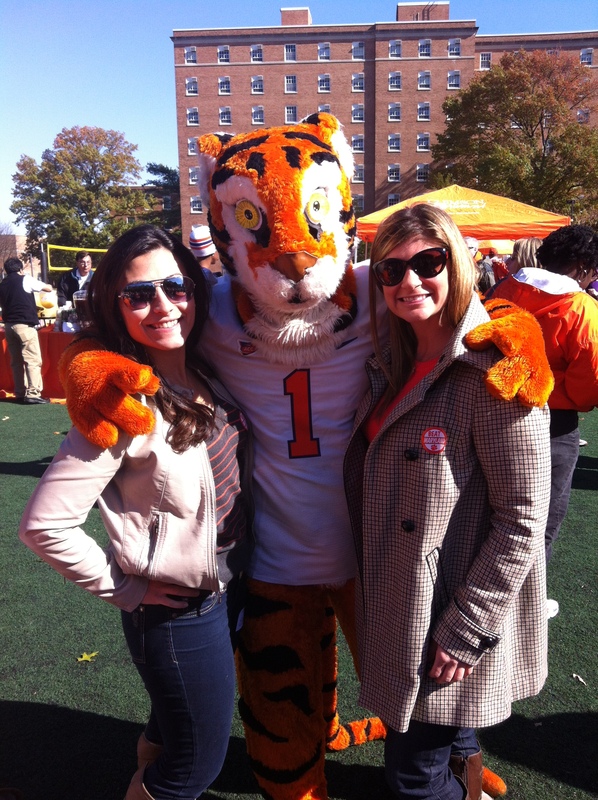 We got to hang out with the Tiger. Our seats weren’t great, but I figured it made more sense to get tickets through Clemson and participate in the whole alumni tailgate experience. It was so much fun – and so cool to see all the orange and prove to Helen that there are plenty of other Clemson crazies such as myself out there – and age is not a factor. There were people who could be my grandparents screaming “Go Tigers” … not to mention this SUPER CUTE little kid who was one pumped little super-fan – during his cheering, Helen looked at me and said would be my kid someday (of course I agreed). Unfortunately, near the end of the game it was so cold we couldn’t feel our hands, feet, or faces … and that’s when the game got interesting. Seriously … we left with less than 10 minutes left in the 4th quarter, and we missed FOUR touchdowns! My Tigers came out victors in the end, so all is still well. I started both my mornings with classes, as well, this weekend, which is always a good time. I had just enough time yesterday morning to get home and get cleaned up and oranged-out after my Pilates class at Sport&Health, and then this morning, I purposely tried to plan ahead, knowing the marathon route was going to make the morning difficult – and I still ended up running into some issues. But I guess that’s why I left about 30 minutes earlier than usual … because it took me 15 minutes, three marines, a police officer, and a traffic officer to figure out how on earth I was going to get to the gym. Hey, marathon organizers … maybe when you say streets will be closed at 8:30, you don’t have them already blocked at 8:15? Just a thought. Perhaps Piloxing fuel this morning? Anyway, it was a fun weekend – it definitely is starting to feel like fall (I’d like to know how we skipped from 80 degrees to 50, though, thanks). Congrats to all those who ran the Marine Corps Marathon this morning! I saw quite the crowd running past my building when I got home from the gym this morning. I’ll have to get the recap on the race from my customer/direct manager tomorrow morning at work – this was marathon #3 for him. I, however, don’t really see the need to spend that much time running. The older I get, the more things start to ache, and I don’t even want to know what would bother me if I decided to run three or more times my normal run. I’ve had several people come to me for advice on how to break into the fitness industry lately, so I thought now was as good a time as any to discuss it here on the blog. It’s no secret that I LOVE teaching group fitness – and that I have aspirations to someday make fitness more than just my love, but also my life. If you’ve taken a few moments to check out Who Am I?, you’ll know that this wasn’t always the case. But thanks to a few good instructors and personal trainers, I’ve had the opportunity to learn a lot – and to be fortunate enough to share my passion with others several times a week. So … thinking becoming a group fitness instructor or personal trainer might be the next logical step for you? Here are a few tips to keep in mind as you’re getting started. Figure out what you really want to do. The certification process is separate for instructors and trainers – and it isn’t cheap. Remember that while trainers can take on clients with just one certification (though many have more than just one), group fitness often involves multiple certifications (I general certification, as well as any specialty certifications – I am currently certified through Spinning, Keiser, Piloxing and PiYo in addition to my general group exercise). Remember that it’s not over once you’re certified. Most certifications need to be renewed either annually or every other year – and many require a certain number of continuing education hours prior to paying your renewal fee. Take classes and/or work with a trainer. Make yourself visible at the club you hope to work at. From a group fitness perspective, many clubs like to hire their own members (they’ve already seen what you can do – and they already know and love you) – your own instructor is a great place to start for tips and help talking to the right people. Getting started on a career in fitness may be intimidating – but if you love fitness enough to want to share it, you’re already off to a great start. As I’m sure all instructors would agree – teaching a class is 100 times better than just taking a class (it’s SO MUCH FUN). And think about how great you’ll feel when you have people in your classes or the clients you train telling you how much you’ve changed their lives. There is truly no better feeling in the world. Happy Thursday everyone! It’s finally starting to feel like fall, and the classes are starting to fill up again – I love it! One new song for you tonight … let’s say that during my government-forced couple weeks off, I had a little bit of time to look into some new music (courtesy of iTunes Radio – a lot of old stuff, but I’ve found a couple new gems, too). Have a great end of your week and a great weekend! 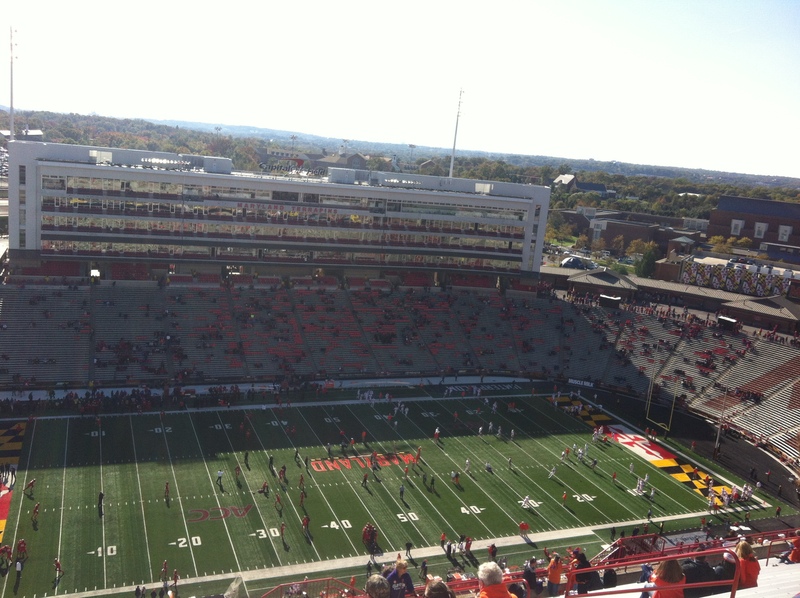 I’m exposing a couple of the girls to Clemson football (the team is making a trip to Maryland on Saturday), so it should be a fun one … and hopefully with a better outcome than last week … but I’m trying to forget that one, so we aren’t going to talk about it. Happy Tuesday everyone! Tonight, I had the pleasure of subbing my first cycle class at Sport&Health Crystal Park. It was a little different for me to teach a 40-minute class … those of you who have been reading and/or cycling with me for a while I have a hard enough time keeping all the fun under an hour. (Who am I kidding? My playlists always clock in around 63 minutes). Thanks for a fun ride, everybody! Remember, Sport&Health folks, you can still catch me on Saturday mornings at 9:30 for Pilates for the next several weeks. XSporters – I’ll see you on Thursday (or tomorrow)!